May is truth time for college students; you’re either walking across the graduation stage or sorrowfully signing up for summer credits. For Danielle Shea, graduation day became a last ditch effort to hide the truth from her mother just one more time. 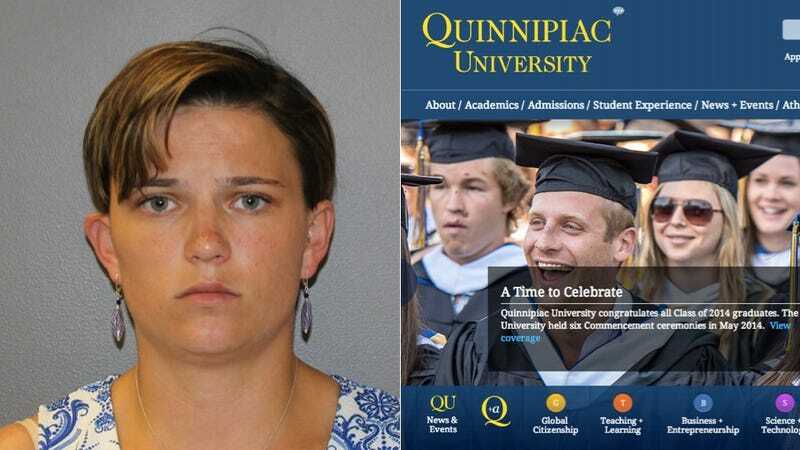 Shea, a Quinnipiac University student, had dropped out but continued to accept "thousands" from her mother who thought she was using it for college expenses, , according to the Daily News. On graduation day, to keep her lie afloat, Shea called in two bomb threats to Quinnipiac in hopes of getting the commencement ceremony cancelled so her mother wouldn't realize she was no longer a student. When the first threat didn’t result in authorities canceling the ceremony immediately, Shea called in another, alleging that there were “several bombs are on campus. You haven’t cleared out graduation. That’s not a good idea.” Two points for ominous movie terrorist speak. After authorities searched the campus and found no explosives, they relocated the graduation to the TD Bank Sports Arena on a different part of Quinnipiac's campus, much to Shea’s disdain, I’m sure. Still, Shea had to keep the ruse alive for mom and showed up to the ceremony in her cap and gown … where she was arrested. Apparently, Shea used her personal telephone to call in the faux bomb threats. Maybe college would’ve helped her think of a better plan? We may never know, because Shea is now sitting in jail, charged with threatening in the first degree and falsely reporting an incident with a $20,000 bond. Photo Credit: AP Images + Quinnipiac.